A simple quick and delicious Low Syn recipe for Stove Top BBQ Chicken that the whole family will love. 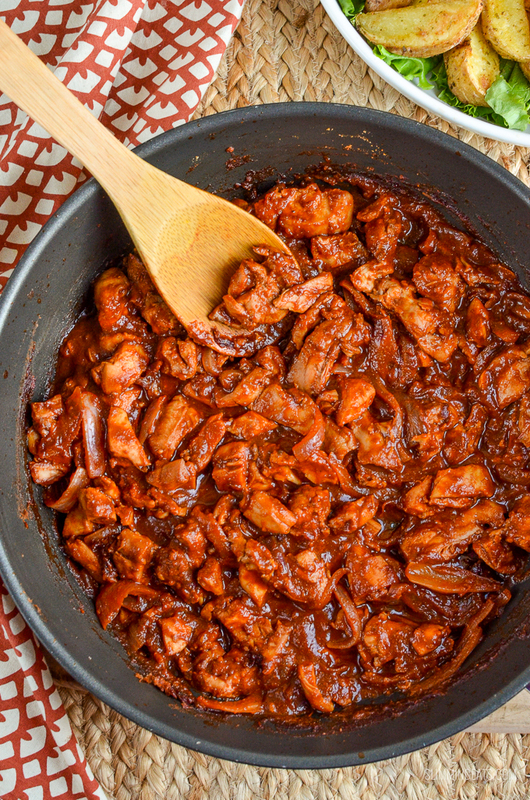 One of the kids favourite recipes which I make often is this Stove Topped BBQ Pulled Pork, it’s a great way of making pulled pork when you are short on time, as it doesn’t need slow cooking like regular pulled pork, but still has that amazing taste and the meat is lovely and tender. 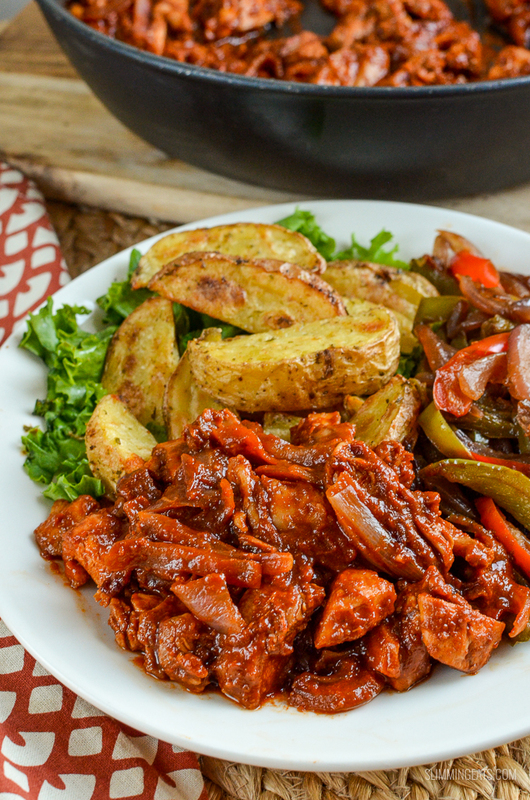 If you haven’t yet tried it yet, check out the recipe and make it along with this new variation – Stove Top BBQ Chicken. I actually had some chicken thighs defrosted out of the freezer for dinner and was trying to decide what to make. 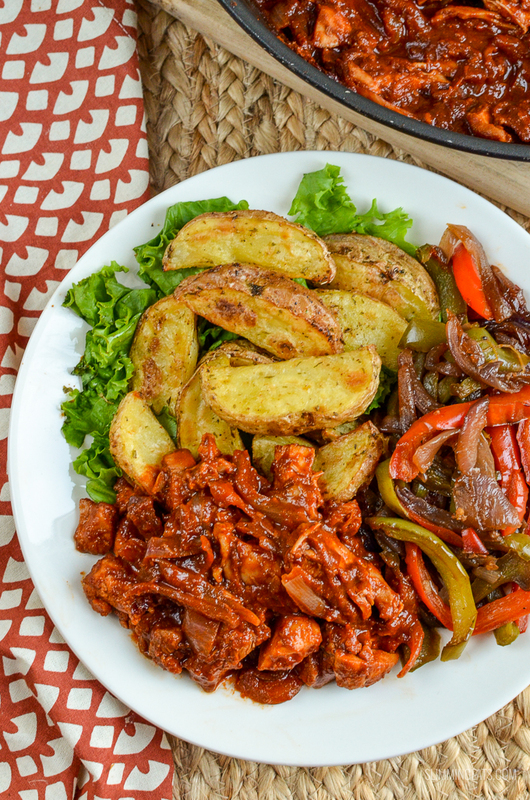 I had planned my Hoisin Chicken (which is another dish the kid’s love), but I tend to serve that with rice and stir-fried veggies and the kids had requested some Potato Wedges. So I figured it was a good time to make something different. A Stove Top BBQ Chicken just seemed like the perfect main to go alongside the Syn Free Garlic and Herb Wedges I had prepped. Which I have to add are pretty darn delicious, full of that lovely garlic flavour and sweet buttery Yukon Gold Potatoes. Seriously the best potatoes you can buy. Look out for the Elfe variety of potato in the UK, which is a similar variety. They are my favourite potato to use and feature regularly in my Syn Free Mashed Potatoes. Before making a start on the Stove Top BBQ Chicken, I quickly had a search of the veggie tray and fridge to see what I could put together for some speed foods. This is regular routine in my house because if I do not have the right speed foods to accompany a dish, I will often change my mind and make something else. Some sauteed peppers and onions seemed like a great choice. I cooked those separately rather than adding to the pan for the BBQ Chicken. I’ll be getting the full recipe for how I made the sauteed peppers and onion up on the blog very soon. They are a great side dish to so many main courses, especially grilled meats, sausages etc. Speed foods are an important part of Slimming World as you will discover on my post The Benefit of Speed Foods. I also recommend reading over my Speed Before Free Foods post too, which will give you some great tips for making sure those speed foods get added to your plate. I use chicken thighs for this Stove Top BBQ Chicken – I just think that cut of meat works better for this style of cooking. The meat stays lovely and tender with the tangy sweet BBQ sauce – so yummy!! and if that’s not enough to choose from, don’t forget my FULL RECIPE INDEX with over 500+ delicious Slimming World Recipes. For the delicious smokey bbq sauce, I use my regular blend of spices and some passata, along with a mixture of vinegar and soy sauce, with my favourite maple syrup to sweeten. It’s what I’ve been using for years when I want a quick BBQ marinade and it really works perfectly for this Stove Top BBQ Chicken. For the cooking, add the sauce ingredients to the pan first, then before turning on the heat, add in the chicken thighs, I just sliced them in half, don’t chop them up small. I also add a sliced red onion as it really adds to the flavour. Now here is where the magic comes in, once you turn on that heat and get it to the bubbling stage, you really don’t want to touch the chicken or move the ingredients around, this is really important for the cooking process. Halfway through the cooking time, you can carefully turn over the chicken pieces, but that’s it, there really is nothing else to do to it. It does the magic all by itself, trust me. 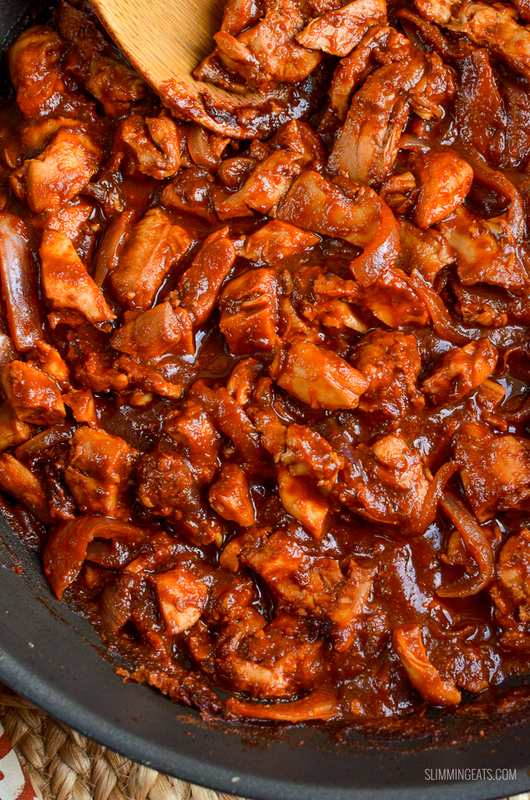 Once the chicken is cooked, remove from the pan, slice/shred with a sharp knife, add it back to the sauce and stir just to coat all the chicken pieces in the sauce. Amazing!!! It gives a perfect amount of sauce for us, but if you like your BBQ chicken a little more saucy (Ooooh errr!! ), then just add in a little water and bubble it for a few more minutes just to thicken. 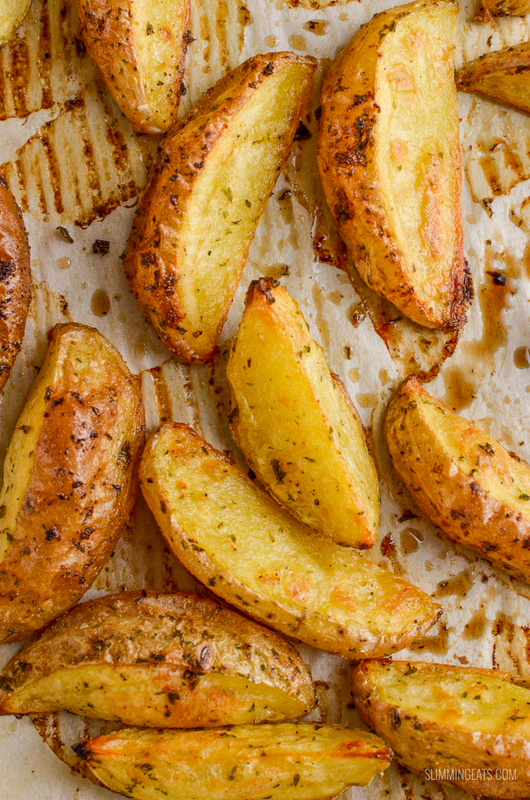 Dish up and serve with your choice of sides, in my case, it was those amazing Garlic and Herb Potato Wedges and Sauteed Peppers and Onion – delicious!! 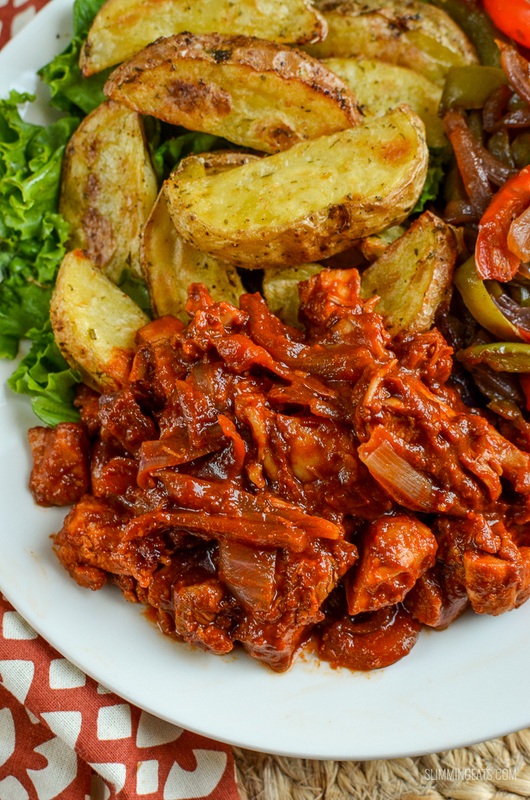 BTW if you have a healthy extra B choice spare, this Stove Top BBQ Chicken would be amazing on a Wholemeal Roll, like a burger. You could even add a little cheddar if you have a healthy extra spare too. Now there is a thought. WHAT KITCHEN ITEMS DO I NEED TO THIS STOVE TOP BBQ CHICKEN? Don’t forget to subscribe to Slimming Eats to keep up to date on all new recipes. Slice each chicken thigh in half. Add all the ingredients for the bbq sauce to a deep frying pan, and stir to combine. Put the heat underneath on high and bring to a boil, once it starts to bubble, reduce heat to medium and leave it to bubble for 18 mins (do not touch or stir in this time, apart from turning over the chicken pieces half way through the cooking time). You want that sauce to really reduce down around the chicken, however if it reduces too much, just add a little bit more water. 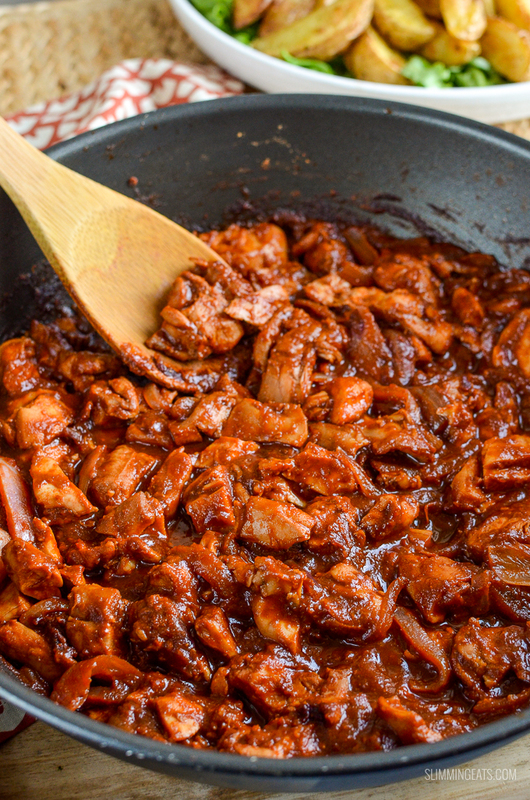 Once cooked, remove chicken pieces from pan and transfer to a chopping board and using a sharp knife, shred into slices and add back to the sauce stirring to coat. Ingredients can vary greatly from brand to brand and therefore it would be impossible to give accurate information. Also, double-check syn values of synned ingredients as different brands can vary. Fantastic dish. All the family loved it. Lovely dish. Hubby loved it. I used Cbicken thighs as per the recipe and it was gorgeous, can’t wait to try it again with Pork. Such a tasty sauce, would highly recommend giving it a try. Hi I’ve made quite a few of your recipes before all have turned out really well and have gone into my regular menus. But this welll…I made this last Sunday to rave reviews from my partner. I had some leftovers. So I made the sauce again mixed with pasta and turned it into a pasta bake. Which was great! Can not recommend this recipe and the site in general. Thanks so much. I have just made this tonight, didn’t have onion powder, garlic powder or smoked paprika. Had some liquid smoke of which I used a 1/4 tsp. Didn’t add the onions because I have a son who will not eat veggies. Cooked the onions and peppers on the side just fried in firelight but they got a little crispy. Next time will just chuck them in with the sauce. Served it with syn free chips and salad. Just managed to stop my husband from adding olive oil to the salad so that was mixed with lemon juice and balsamic vinegar. It was absolutely gorgeous and I give it 5 stars even with the missing ingredients. I made this last week and my husband said it was the best meal I’d ever cooked for him! We’ve been together 22 years lol! Anyway, it’s amazing and I’m making it again tonight. Thank you. I want to make a larger portion of this. Do I double the amount of spices? Hi Carol, yes I would double the spices. Hi. Looking forward to trying this. I don’t have maple syrup and would rather not buy it unless I have to. Do you think that honey or golden syrup would work instead? Can’t wait to try this! Is there any alternative to maple syrup? Would honey work or does it have to be syrup? Hi Hollie – honey or brown sugar will work fine as an alternative to the maple syrup. Hi Suki – honey or brown sugar will work fine as an alternative to the maple syrup. I made the sauce to go with some pulled pork. It was really easy to make and absolutely delicious. The best low syn bbq sauce I’ve tried. Thank you. So glad you enjoyed it. It’s definitely one of my kids favourites. Since coming across your website very recently I’ve made a few of the recipes all have been delicious. Just made this tonight and it was truly delicious. A huge thumbs up. And definitely one to remake again and again. I also made your chips to go with it and they were a huge success also. So glad I found your site and find myself looking for more recipes when I have those nights when I can’t sleep !! Hi Polly, thank you for taking the time to comment. I am so happy you are enjoying the recipes. I use just regular soy sauce, that is neither labelled as dark or light. Is cider vinegar essential. I don’t have any and no real wish to buy it. Is there an alternative or just leave it out? Thank You. Looking forward to making this. Hiya, you can use any white vinegar in its place. Made this tonight, was a big hit with the whole family, even my fussy son loved it! Will definitely be making it again!